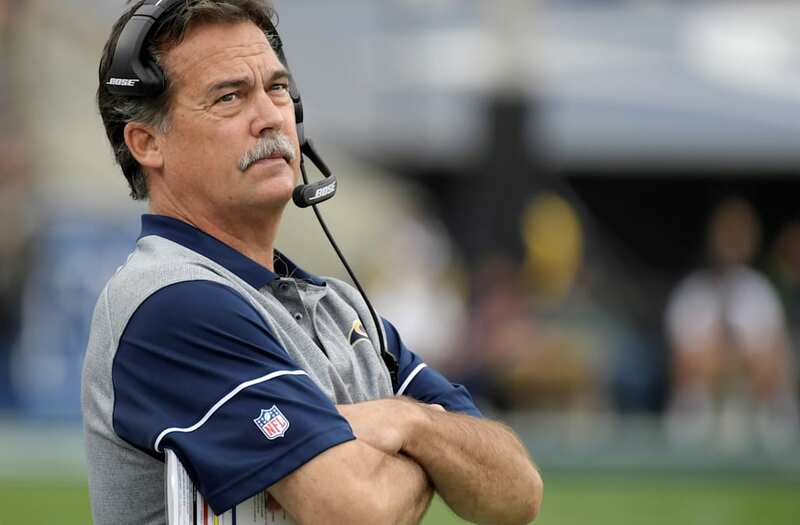 After being fired as head coach of the Los Angeles Rams on Monday, all Jeff Fisher wants to do now is ... beat the Los Angeles Rams. The NFL veteran who led the team's transition from St. Louis, Missouri, back to L.A. earlier this year sat down with Fox for an interview that will air Sunday morning. When asked by "Fox NFL Kickoff" host Charissa Thompson to "fill in the blank" as to why he was fired, Fisher answered in the third person: "because he didn't win enough games and the organization has a much bigger picture ... and I don't think I was a part of the city and the stadium," he said, referring to the $2.66 billion stadium currently being built in Inglewood. "Do you have a perfect scenario?" Thompson asked. "I want a chance to play the Rams," the NFL veteran replied. The brief teaser didn't share anymore details, but Fisher's dramatic entrance walk down a hotel corridor suggests that there will be some must-watch bombshells dropped. Fisher, a Southern California native who played football for USC and was drafted by the Chicago Bears, began his head coaching career in 1994 with the Tennessee Titans and went on to helm the St. Louis and (briefly) the L.A. Rams. However, following an increasingly disappointing return to the City of Angels culminating in a devastating 42-14 loss to the Atlanta Falcons at home on Sunday, Fisher was given his walking papers the following day. "This is the right time to make a change as our performance has not lived up to my or our fans' expectations. We all are focused on improving as an organization and building a team that makes Los Angeles proud. Our mission is to celebrate a Super Bowl title with our fans in Los Angeles. Today is the first step to bringing us closer to that goal," Rams owner E. Stanley Kroenke said in a statement. "Making a decision such as this, especially during the season, is one of the most difficult in sports." "First and foremost, I want to thank (Rams owner) Stan Kroenke for the opportunity to be part of this organization the last four and a half years," Fisher said in his own statement Tuesday. "I want to thank the entire football staff as it has been a privilege to work with each one of them day in and day out. "I especially want to thank all of the players. They are a great group of men that I respect, and that I will greatly miss. My hope is that each one of the players experience great success in the future." Fisher, 58, was hired as the Rams' head coach in 2012 and has compiled a record of 31-45-1 in nearly five seasons. Special-teams coordinator John Fassel stepped up as interim head coach for the rest of the season, however, he suffered his first loss to the Seattle Seahawks Thursday, sending the team to a 4-10 record. Watch the interview with Fisher here. "Fox NFL Kickoff" airs Sunday at 8 a.m. PT/11 a.m. ET on Fox.